Let us pick up your laundry so you can get back your time! Washers and dryers in a variety of sizes to provide you with options no matter your need. Too much laundry, too little time? Bring your laundry to our Indian River laundromat centrally located between Chesapeake, Virginia Beach, and Norfolk and get your time back! Does your business have tablecloths, sheets, towels, or uniforms that need cleaning? Let us take care of the laundry so you can get back to running your business! 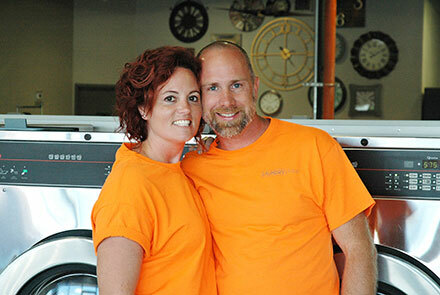 We are a local family owned laundromat serving the Chesapeake, Norfolk, and Virginia Beach area since 2005. With 2 coin operated laundromats to choose from, Laundry Place is dedicated to giving you reliable laundry services or your money back. Check out our Chesapeake laundromats or our commercial laundry service where we launder tablecloths, sheets, towels, uniforms and more! I love the fact that cards can be used to buy almost everything....It is a clean environment, and it has Wi-Fi! What's not to like? Thank you for fast service and customer care!